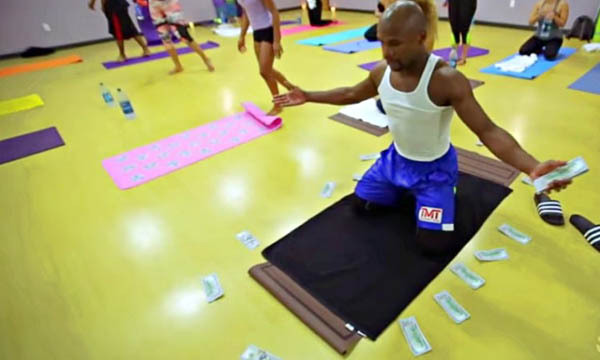 To prepare for a match in Las Vegas a few weeks ago, boxer Floyd Mayweather took up yoga to increase his flexibility, according to USA Today Sports. Both Mayweather and his opponent, Marcos Maidana, allowed Showtime to film behind the scenes of their training routines; when Showtime went to a yoga class with the energetic Mayweather, however, it apparently got a little more than it was bargaining for. Following this preparation, Mayweather gets down to business and goes along with the rest of the yoga class in a more serious fashion—at one point, he says that if he’s more limber, he’ll be able to perform a lot better. The one thing that varies from a traditional yoga practice is when he takes a break from the class to eat two Big Macs, followed by what appears to be a head massage. This strategy seems to have paid off, as Mayweather was victorious against Maidana in their September 13 match. Using what USA Today calls “a brilliant gameplan,” Mayweather landed significantly more punches than Maidana and earned a cool $32 million for one night of boxing. Back in 2012, Mayweather told the Las Vegas Sun that he had never stretched in his entire career until he began doing Bikram yoga. “I think I can push myself and perform a lot better with yoga,” Mayweather said. Clearly, his methods are a little unusual, but they’re working so far!